I’ve been working with profunctors lately. They are interesting beasts, both in category theory and in programming. In Haskell, they form the basis of profunctor optics–in particular the lens library. The categorical definition of a profunctor doesn’t even begin to describe its richness. You might say that it’s just a functor from a product category to (I’ll stick to for simplicity, but there are generalizations to other categories as well). Notice that the first morphism goes in the opposite direction to what we normally expect for functors. We say that the profunctor is contravariant in its first argument and covariant in the second. But what’s so special about this particular combination of source and target categories? The key point is to realize that a profunctor generalizes the idea of a hom-functor. Like a profunctor, a hom-functor maps pairs of objects to sets. Indeed, for any two objects in we have the set of morphisms between them, . This (plus functorial laws) completes the definition of a functor from to . So a hom-functor is a special case of an endo-profunctor (where is the same as ). It’s contravariant in the first argument and covariant in the second. The function dimap does the lifting of a pair of morphisms. can be composed with by lifting . This is how we can use a profunctor to glue together two categories. Two categories connected by a profunctor form a new category known as their collage. 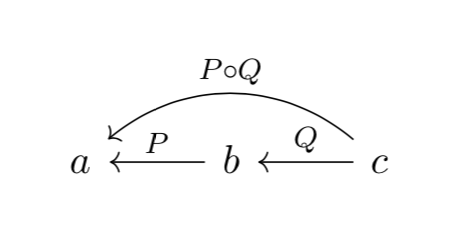 A given profunctor provides unidirectional flow of heteromorphisms from to , so there is no opportunity to compose two heteromorphisms. The opportunity to compose heteromorphisms arises when we decide to glue more than two categories. The clue as how to proceed comes from yet another interpretation of profunctors: as proof-relevant relations. In classical logic, a relation between sets assigns a Boolean true or false to each pair of elements. The elements are either related or not, period. In proof-relevant logic, we are not only interested in whether something is true, but also in gathering witnesses to the proofs. So, instead of assigning a single Boolean to each pair of elements, we assign a whole set. If the set is empty, the elements are unrelated. If it’s non-empty, each element is a separate witness to the relation. This definition of a relation can be generalized to any category. In fact there is already a natural relation between objects in a category–the one defined by hom-sets. Two objects and are related this way if the hom-set is non-empty. Each morphism in serves as a witness to this relation. With profunctors, we can define proof-relevant relations between objects that are taken from different categories. Object in is related to object in if is a non-empty set. Moreover, each element of this set serves as a witness for the relation. Because of functoriality of , this relation is compatible with the categorical structure, that is, it composes nicely with the relation defined by hom-sets. In general, a composition of two relations and , denoted by is defined as a path between objects. Objects and are related if there is a go-between object such that both and are non-empty. As a witness of this relation we can pick any pair of elements, one from and one from . 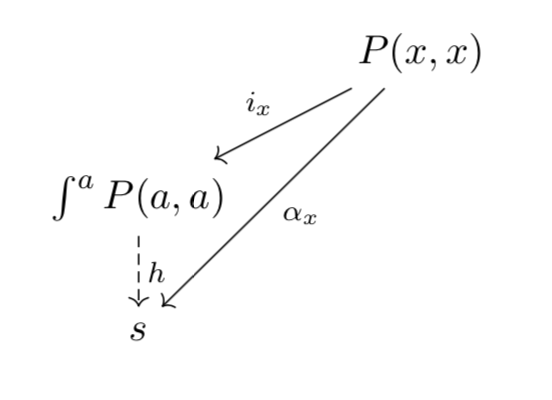 By convention, a profunctor is drawn as an arrow (often crossed) from to , . The existential quantifier is expressed in terms of a GADT (Generalized Algebraic Data Type), with the free occurrence of b inside the data constructor. By now you might be getting lost juggling the variances of objects appearing in those formulas. The coend variable, for instance, must appear under the integral sign once in the covariant and once in the contravariant position, and the variances on the right must match the variances on the left. Fortunately, there is a precedent in a different branch of mathematics, tensor calculus in vector spaces, with the kind of notation that takes care of variances. Einstein coopted and expanded this notation in his theory of relativity. Let’s see if we can adapt this technique to the calculus of profunctors. for any set . Programmers know this identity as a generalization of case analysis: a function from a sum type is a product of functions (one function per case). If we interpret the coend as an existential quantifier, the end is equivalent to a universal quantifier. with the right hand side natural in . Again, we don’t perform implicit summation on the right, where the repeated indices are separated by an arrow. There, the repeated index is universally quantified (through the end), giving rise to a natural transformation. Since profunctors can be composed using the coend formula, it’s natural to ask if there is a category in which they work as morphisms. 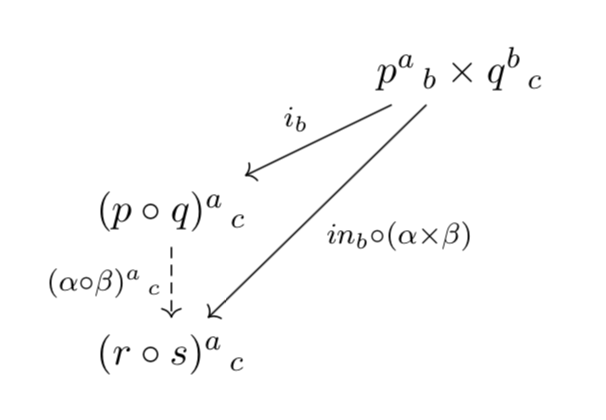 The only problem is that profunctor composition satisfies the associativity and unit laws (see the co-Yoneda lemma above) only up to isomorphism. Not to worry, there is a name for that: a bicategory. In a bicategory we have objects, which are called 0-cells; morphisms, which are called 1-cells; and morphisms between morphisms, which are called 2-cells. When we say that categorical laws are satisfied up to isomorphism, it means that there is an invertible 2-cell that maps one side of the law to another. satisfying the usual naturality conditions. Natural transformations between profunctors can be composed as functions (this is called vertical composition). In fact 2-cells in any bicategory are composable, and there always is a unit 2-cell. It follows that 1-cells between any two 0-cells form a category called the hom-category. The fact that a monad is a monoid in the category of endofunctors is a lucky accident. That’s because, in general, a monad can be defined in any bicategory, and just happens to be a (strict) bicategory. It has (small) categories as 0-cells, functors as 1-cells, and natural transformations as 2-cells. A monad is defined as a combination of a 0-cell (you need a category to define a monad), an endo-1-cell (that would be an endofunctor in that category), and two 2-cells. These 2-cells are variably called multiplication and unit, and , or join and return. Remember that is the hom-profunctor in the category which, due to co-Yoneda, happens to be the unit of profunctor composition. Programmers might recognize elements of the Haskell Arrow in it (see my blog post on monoids). Notice that this looks very much like composition of heteromorphisms. Moreover, the monadic unit maps regular morphisms to heteromorphisms. We can then construct a new category, whose objects are the same as the objects of , with hom-sets given by the profunctor . That is, a hom set from to is the set . We can define an identity-on-object functor from to that category, whose action on hom-sets is given by . Since is identity on objects, the composition of morphisms in can be used to define the composition of heteromorphisms. This, in turn, can be used to define , thus showing that is a promonad on . It wasn’t obvious to me how to encode the identity-on-objects functor in Haskell, so I asked Michael Sloan, and he came up with the following implementation. Strength is essential in programming languages, because it allows us to perform calculations in context. Contexts are modeled as products of individual definitions. Performing a monadic computation often requires access to some external context, so it’s important to be able to bring product components into the scope of the computation. What might be even more interesting is exploring the converse: any Arrow is equivalent to an identity-on-objects functor. I realize that I have touched upon some pretty advanced topics in category theory, like bicategories and promonads, so it’s a little surprising that these concepts can be illustrated in Haskell, some of them being present in popular libraries, like the Arrow library, which has applications in functional reactive programming. I’ve been experimenting with applying Einstein’s summation convention to profunctors, admittedly with mixed results. This is definitely work in progress and I welcome suggestions to improve it. The main problem is that we sometimes need to apply the sum (coend), and at other times the product (end) to repeated indices. This is in particular awkward in the formulation of the mapping out property. I suggest separating the non-summed indices with product signs or arrows but I’m not sure how well this will work. We can pick equal to and implement the function using the components of the two natural transformations, . Of course, this is how a programmer might think of it. A mathematician will use the universal property of the coend , as in the diagram below (courtesy Alex Campbell). I’m grateful to Alex Campbell from Macquarie University in Sydney for extensive help with this blog post.